Read Jason's story below and watch him in action with his twins! My wife’s pregnancy with twins Jack and Ava was relatively uneventful. Ava was a little shy during sonograms (at three, she’s now making up for lost camera-time, and is now a bit of a ham, like her dad), but otherwise, their progress was going smoothly, and mom and kids were both healthy. On June 13, my wife Kristi had complained about a back ache, but we thought nothing of it – back aches while carrying twins were an expected part of the process. At 3:40 in the morning on June 14, she woke me up and told me she was not feeling well, and that we should probably get over to the hospital. We had gone to a wedding the weekend before, and I was sure we had just overdone it a little – they might keep Kristi for observation for a few days, make her comfortable, and then send us home to finish out the remaining months of our pregnancy. When we got to the hospital exam room, all hell broke loose. The back aches weren’t really back aches, but contractions… and Jack, ever the instigator, was on his way. They rushed Kristi back to an exam room, and rushed me into a side room to get into OR scrubs. We were signing releases and paperwork as we went along. At exactly 4:41 AM, Jack Thomas Butkowski (Baby A for the first two days of his life), weighing 2 lbs., 12 oz., was born, 28 weeks into our pregnancy and two and a half months before his scheduled due date. I was in a state of shock, and the nurse had to remind me to take photos with my cell phone camera. Baby B, Ava Rose Butkowski, was born at 5:00 AM via C-section, weighing 3 lbs., 2 oz. In retrospect, we were lucky. Aside from the usual set of premie health concerns, my kids were otherwise healthy. They spent time in an incubator and under UV lamps for jaundice. They were hooked up to respirators and feeding tubes. They were our babies in a bubble, but any of the more serious premie complications, which might require surgery or impact them later in life, were otherwise avoided. Kristi spent her maternity leave caring for them in the hospital, while I went back to work during the day. Once I got off work, we would head back to the hospital together, and stay with our kids until 11 at night, only to start the whole cycle over the next day. We spent 69 days in the NICU, and while Jack and Ava were gaining weight and making progress, the doctors warned us not to even chance daycare for the first six months, because their immune systems could not handle it. We took Jack and Ava for monthly vaccines, had strategically placed bottles of Purel throughout the house, and limited their trips out of the house to necessary medical appointments. Because New Jersey has paid family leave, we were able to focus on their needs for the first six months, and didn’t have to worry about losing a paycheck. Kristi extended her time with them once they came home with six weeks of paid family leave. When Kristi had used all of her paid benefits, I took my remaining vacation and sick time, and finally, took my own paid family leave to get us to the six month mark before we had to put them in daycare. The time I spent with my kids was just as important for me as it was for them. Their status as premies forced me to be present – physically and emotionally – and I think I’m closer to my kids than I would otherwise have been without this benefit. I’ve been working since I was 14, and honestly, had my kids not had this serious medical need, I probably would have taken only a little bit of time – maybe a week – and went right back to work, because that’s what I’ve always done. Unfortunately, only a handful of states currently offer paid family leave, even though most developed nations have some sort of paid family leave benefit. People ask us what we would have done if paid family leave wasn’t an option for us, and I tell them we would have figured it out. Parents always do — even if it means deep sacrifices to financial security in order to get by. I’m so thankful that our home state offered paid family leave, so that we could focus on our parental responsibilities, rather than stressing about our financial responsibilities. It allowed us to spend time changing diapers, rather than worrying about how we were going to pay for diapers. 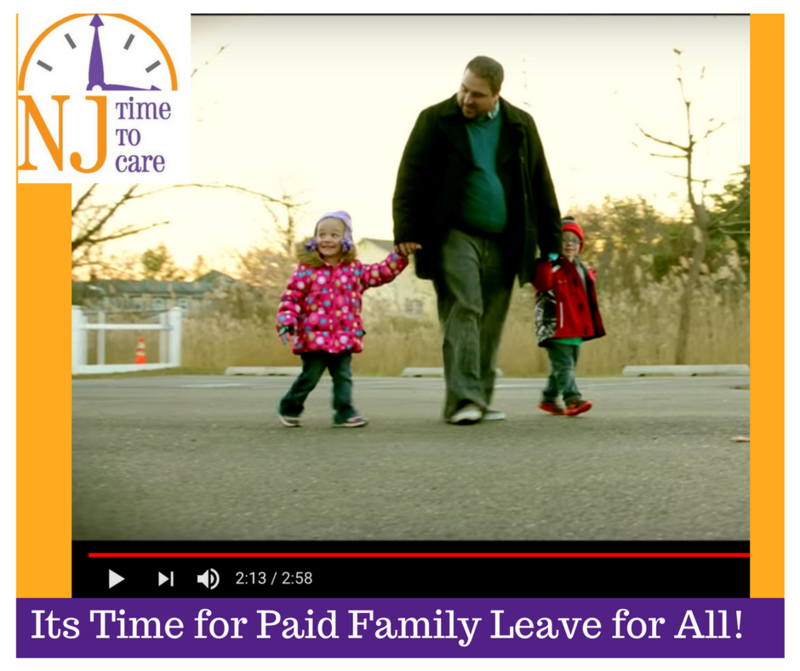 Paid Family Leave, at its core, is about respect for working families – working moms and dads caring for a newborn child or children, working sons and daughters caring for an ill parent, working husbands and wives caring for an ill spouse or partner. This is a program that made a difference in my family’s lives, and it’s something that I wish was available to more families throughout the country. For families trying to balance family responsibilities with financial realities – families like mine – it’s the right thing to do.